The Boeing 787-8 is my office, but more than that, it sometimes feels like my home. As an International Long-Haul Crew Member, I spend more hours in an airplane than outside of; so being on an aircraft that is newly built and quite well designed is appreciated. It makes work life better and easier. The little things— like motion sensor faucets in the lavatories or a trash compactor in the aft galley really matter to a flight attendant. There’s more to my office that one outside of the industry, or one who has never worked on this aircraft, would have ever thought about. So, consider this an inside tour of what it’s like working, flying, and basically living on the Dreamliner. I haven’t been in aviation long—just over seven years—but I know enough to understand that airplanes are not created equal. Thankfully, I started as a new flight attendant working on the MD-80 as opposed to being introduced to the Dreamliner from day one. If that had been the case, I don’t believe that I would have survived the change from new to old, wide body to narrow, quiet vs. “I think I might go deaf…” You get the idea. The Boeing 787-8 is not the worst cubicle to be stuck in for eight hours plus—day or night. I like this plane because it’s large— a double aisle, wide-bodied aircraft with 291 passenger seats on the specific configuration that I operate. The crew operating the 787-8 is at least eight in the cabin and two in the cockpit, more depending on the flight time or route. Flight attendants, whether they will admit it or not, love the galleys of an aircraft, not because each crew member necessarily likes “working the galley,” but it is often the only space to find space away from travelers. On the Dreamliner, the three galleys allow for a break between passenger rows and passenger needs. These galley spaces become insanely busy during inflight service, and to create a seamless flight, cabin crew value how the area is organized and designed. 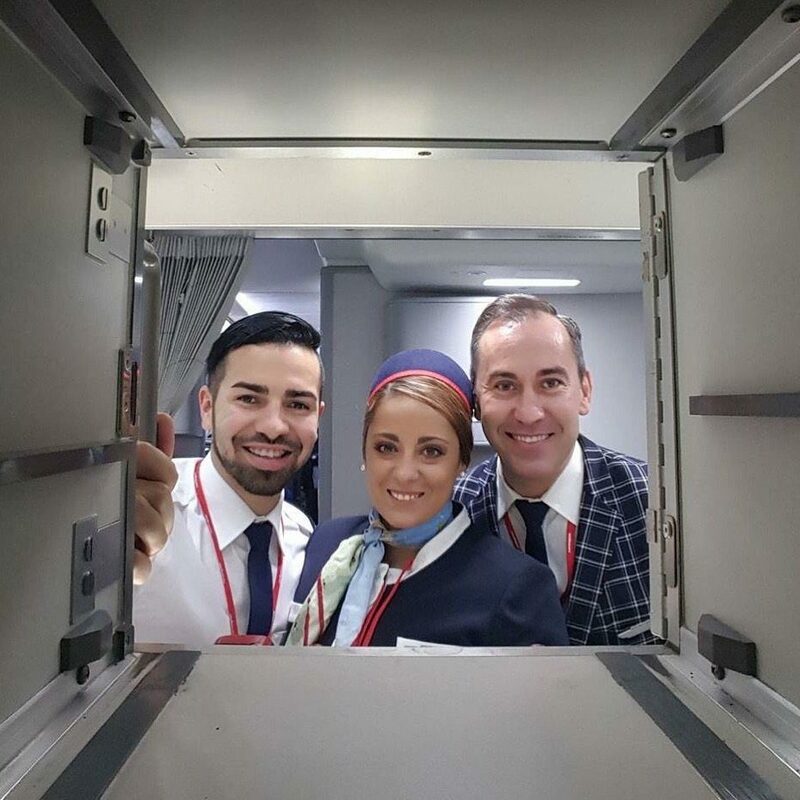 On the Boeing 787-8, the double stacked atlas boxes in the mid-galley, “ceiling” built cubbies with reflective mirrors, heated floors and galley heaters, are just a few of the additions that make my working life as a flight attendant better. Waste and excessive amounts of trash are problems that cabin crew have to solve when working long-haul. The Dreamliner’s trash compactor and two incredibly large waste bins tucked away in the corners of the aft galley help to mitigate the concerns of overflowing waste. There’s no reason that waste need be stuffed and locked away illegally in the lavatory on this aircraft. The motion sensor toilets and sinks in all lavatories is a part of my work life that I never thought I would see on an airplane. On the MD-80, the crew was simply happy if the toilets actually worked properly. I have this bad habit now of walking into any lavatory, on any aircraft, and waving my hands in front of the flush button that says, “Push.” I’m expecting something to happen, but need to be reminded that it’s the Dreamliner that responds to “Abra Cadabra” hand gestures for flushing toilets and hand washing water. There are other aspects of this aircraft that I, as crew, take for granted. The lower pressurization of the cabin, the dimmable windows, and the flight attendant call buttons that can be locked are only a few of them. There’s so many auto and individual features that crew can change and alter. A passenger who has ordered too many alcoholic drinks? I’ll lock their screen by sending them a child’s movie. From a digital touch screen located in three parts of the cabin, I can control call buttons, reading lights, windows, and cabin temperature. No more calling the pilots because it’s too cold. The air matters on the Dreamliner, especially when flying long flights that are over nine hours. Jet lag is lessened and skin becomes less dry due to the lower pressurization and better air circulation. Crew battle insane amounts of jet lag, but compared to working on a 757 and MD-80 where headaches and sickness were a constant for me, I find myself with some energy and no migraines. Flight attendants have one of the most unhealthy jobs in the world. It’s a job that is said to decrease a person’s lifespan by up to five years. Boeing Corporation has tried to take into account crew needs, both from an ability to conduct their work and from the need to maintain health, and to this, I’m thankful. Soon, my airline will introduce the Boeing 787-9, the larger, longer range version of the 8, equipped with more passenger seats and crew than “baby brother.” I’ll be sure and share the next office view with you. Hoped you enjoyed this tour.